What distinguishes oval mid-size showcases from other curio cabinets? This style trophy case is part of a great collection of retail display cabinets that feature 360° visibility. A tempered-glass oval trophy case is also frequently set up in a high school hallway or a hall of fame, where it exhibits awards, trophies, and achievements for everyone to see. One of the main features of the line of display fixtures is the curved design, which allows viewers to walk around the entire perimeter and see in from every angle. The commercial grade oval glass cabinet, or awards case, is innovative in that it includes a lighting system to make viewing even easier. The full-vision curving tower comes equipped with either overhead lighting or both top and side lamps to highlight jewelry, artifacts, memorabilia, photographs, or other collectibles. What makes the curved design a practical option for so many locations? The oval surface of these trophy cases creates a warm, natural effect that is perfect for welcoming customers or guests. When these display cabinets are placed against walls, they showcase merchandise from the side as well as the front. This configuration works especially well when combined with the side light fixtures. Curved glass with a full-view design not only draws more attention, but also doubles the amount of people that can look at one time. What other design features do these mid-width cabinets offer users? These showcases for school displays measure 38 inches wide, 76 inches tall, and 22 inches in diameter, which provides ample storage space for a variety of items. In addition, four individual glass shelves provide enough room to house large or awkward-shaped components. An inner mirror deck is also included, which adds depth to displayed articles and reflects light. Two choices for lighting systems supply solutions for any application. Choose from recessed top lights alone or both overhead and side lamps. The 50-watt bulbs offer bright yet subdued illumination to elegantly accentuate retail objects or personal collections. 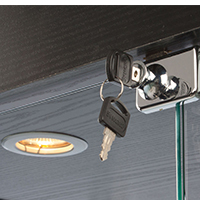 A key lock keeps important articles safe from tampering or theft. Customers or guests can only handle the contents with you or your staff present, which helps ensure no valuables are lost, stolen, or damaged. Wheels are yet another practical attribute these showcases offer. The casters are attached to the underside of the structure and are hidden beneath the bottom. Easy maneuverability without the tacky look of caster wheels makes these units very popular choices. Tempered glass is used in the production of these display cabinets to keep shoppers and staff safe in the event they are broken. Typical glass shatters into dangerous shards that are difficult to clean up. Tempered components are engineered to crumble into rounded pieces, similar to that of a car windshield. This feature helps make the disposal of the shattered glass much safer and reduces the likelihood of injuries. These display fixtures for awards, trophies, and school accomplishments make professional collection presentations an easy task. Just close and lock the doors, so that no one is able to tamper with the contents of the display cabinets. The illumination options offer two arrays to help buyers find the most appropriate models. Some other styles feature softer lights, but these 50-watt lamps are brighter for a stunning accent. In addition, various finishes are provided to accommodate a massive range of atmospheres and environments. From casual to upscale, these units work well anywhere. Check out the huge selection on the web to get the most versatile model. In any case, the display cabinets are shipped unassembled to keep shipping costs lower for both the company and customers. Assembly is straightforward, though, and users can easily follow the detailed directions enclosed with every order.